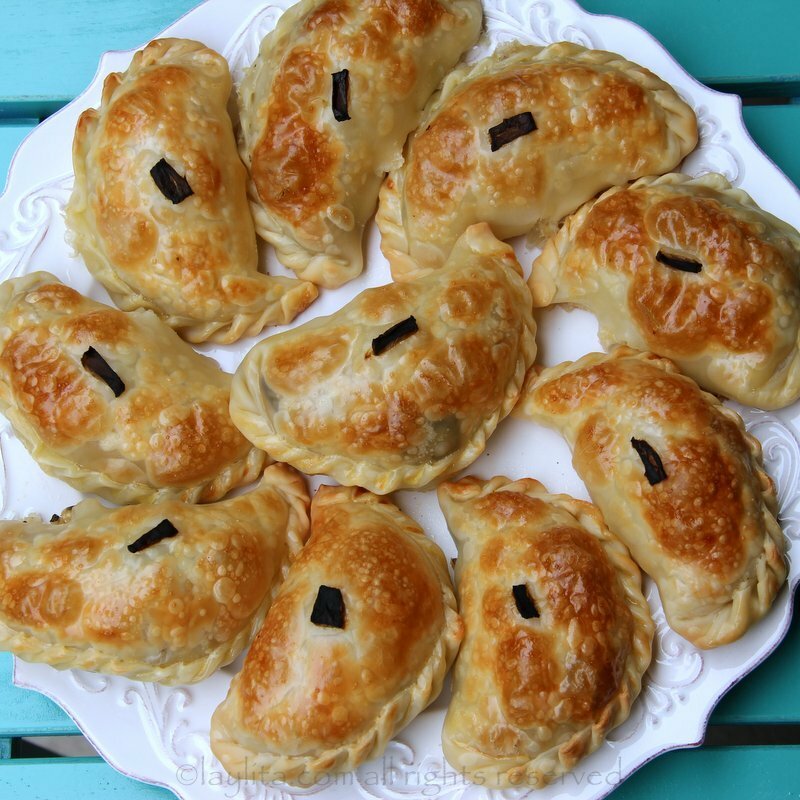 These homemade cheesy poblano empanadas are filled with rajas or roasted poblano peppers, and a mix of queso fresco, oaxaca cheese, and goat cheese. 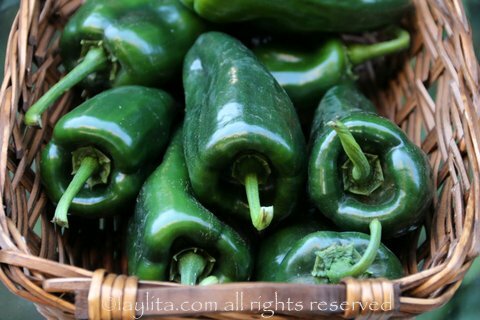 I love poblano peppers, they have the perfect blend of heat and flavor. In general, poblanos are relatively mild, however sometimes they can be on spicier side. 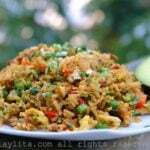 They are also ideal for stuffing and can be prepared filled with a variety of different filling combinations. In Ecuador, I didn’t grow up poblano peppers, however my mom talked about them frequently– she grew up in New Mexico and these chili peppers were one of the things that she missed the most. She used to make and sell chiles rellenos for extra cash while she was in college; and I’ve heard from family members that hers were really good. So, even though I didn’t grown up eating them, there must be something in my genes that made me love these peppers from the first bite. 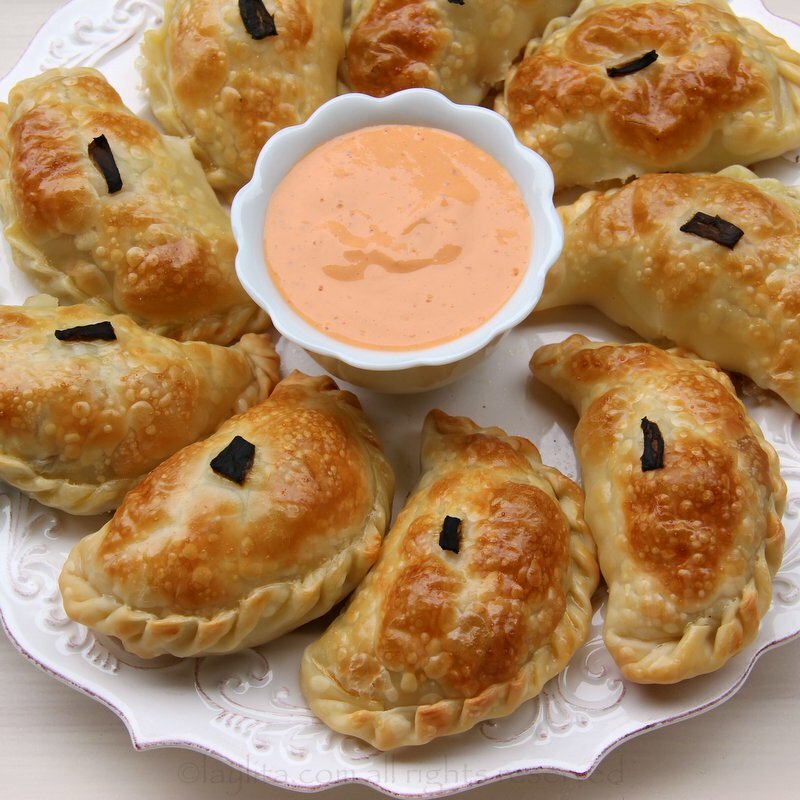 Easy recipe for homemade cheesy poblano empanadas filled with rajas or roasted poblano peppers, and a mix of queso fresco, oaxaca, and goat cheese. 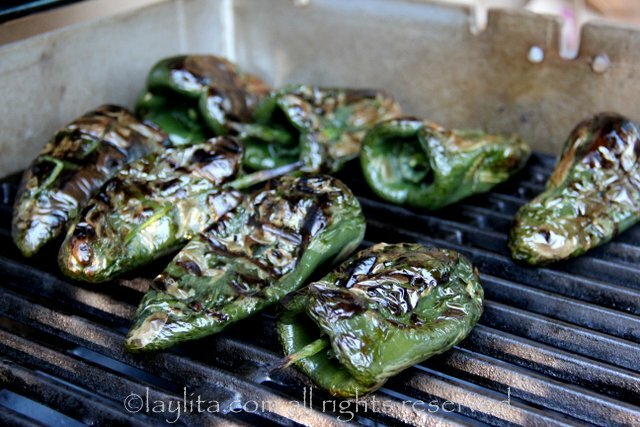 The poblano peppers can be roasted on the grill, in the oven under the broiler, or over the flame on a gas stove. I recommend grilling as the first option, place the peppers on a hot grill and grill on each side until they are blackened or charred. Next best option is to place them on a baking sheet and put them under the broiler (set to high) and roast on each side until charred. For the stove stop method, my least favorite because the fumes can be strong, use thongs to hold the poblano peppers and place them close to the flame, turn until they are blackened. Place the poblano peppers in a bowl and cover with plastic wrap for about 10 minutes– this will help them sweat so that the skin becomes very loose and easy to remove. Peel off the skins from the roasted peppers, cut them half and remove the seeds and stems. Remove any liquid inside the peppers. Cut the poblano peppers into strips and then cut them into small pieces, about ½ inch to 1 inch wide. 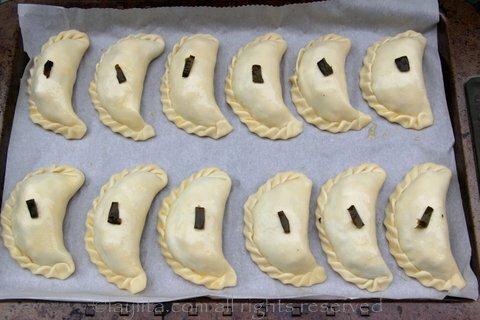 To assemble the empanadas, place a spoonful or two of the cheese mixture and some chopped roasted poblano peppers or rajas on the middle of each empanada disc. 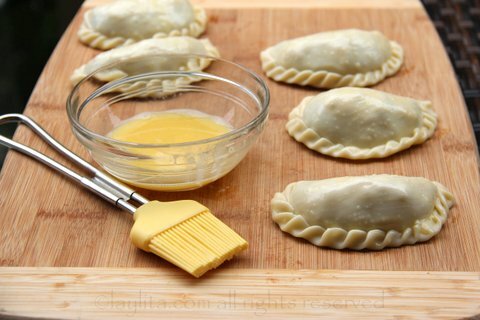 Before baking, brush the top of the empanadas with the egg yolk; this will give a nice golden glow when they bake. 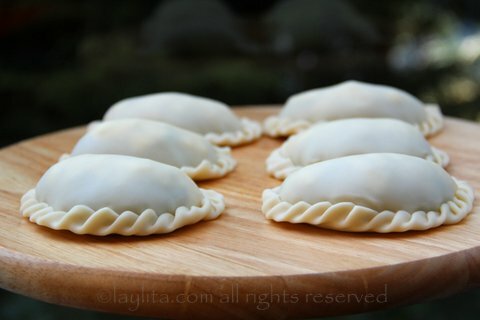 If you are making several batches of different empanadas and have any poblanos left over, you can place a small piece of the pepper on top of each empanada as a marker to help identify the filling. 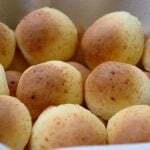 Bake in a pre-heated oven at 400F for 20 minutes or until golden. 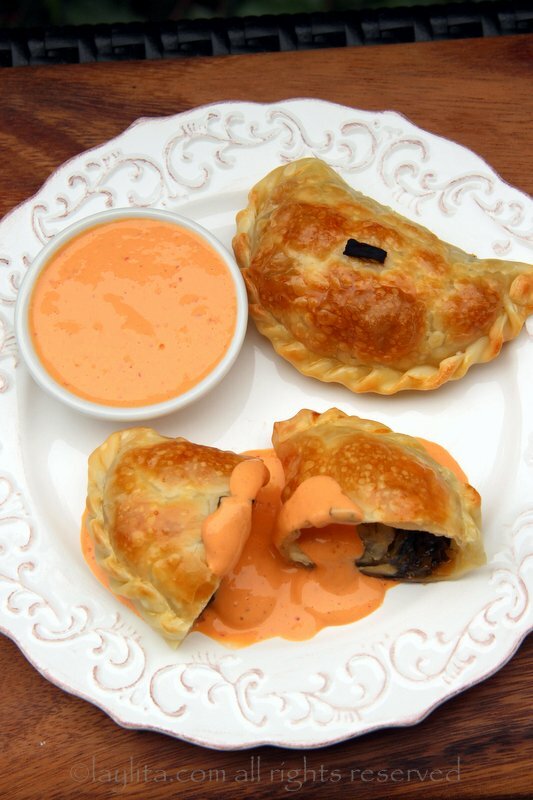 Serve the poblano and cheese empanadas with your choice of dipping sauce. 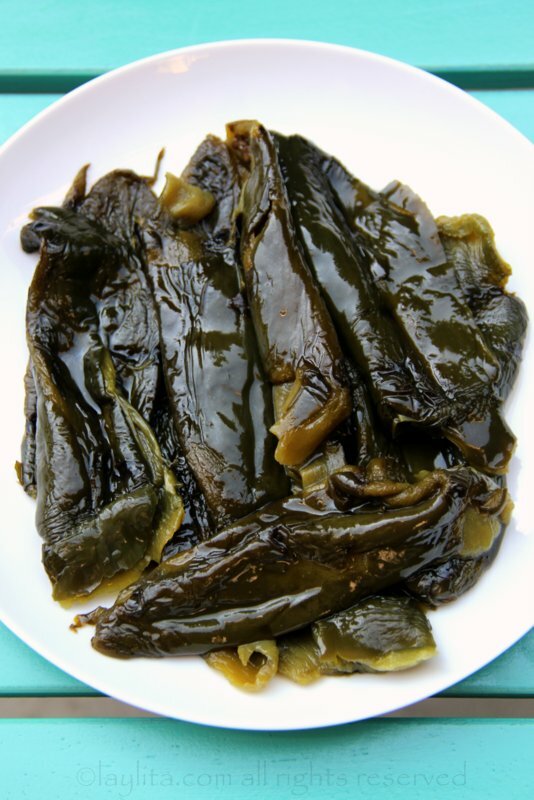 Most recipes for poblanos usually involve roasting them and then peeling off the skin. 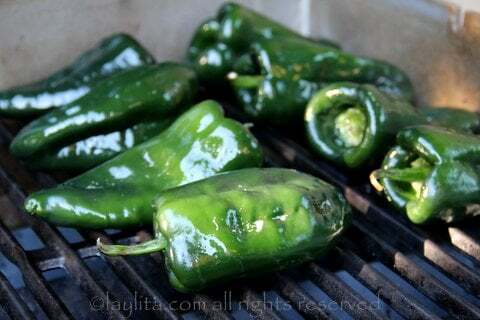 The poblano chiles can be roasted in the oven, on the grill, or on a gas stovetop. If the weather permits it’s best to grill them since it keep the fumes outside. 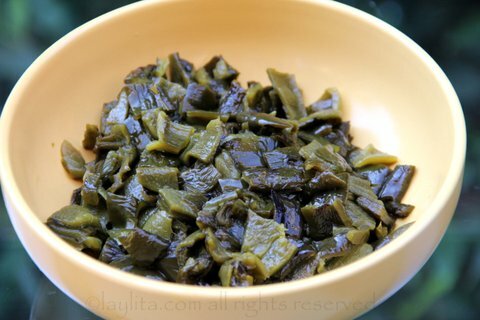 The fumes from roasting poblanos in the oven or on stove can be very strong – I was telling my mom that roasting poblanos reminded me of the student protests/clashes with the police when I lived in Loja. These protests would take place every once in a while and would usually involve the police dispersing the students with the use of tear gas – if you happened to be out when this occurred, you would either rush home, or take refuge in a friend’s house, or even inside the nearest random store (which would close the doors) – depending on how close you were to the main plaza you would usually smell or feel slight effects from the gas. 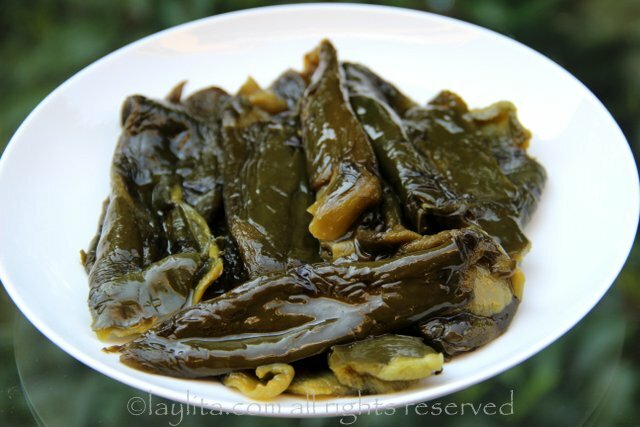 I also suggest using gloves when peeling the roasted poblanos, and if you wear contacts (like me) don’t make the mistake of not using gloves – it will be very painful when you touch your eyes to remove your contacts that night. The roasted and peeled strips of poblano peppers are also known as rajas, which translates literally as strips. 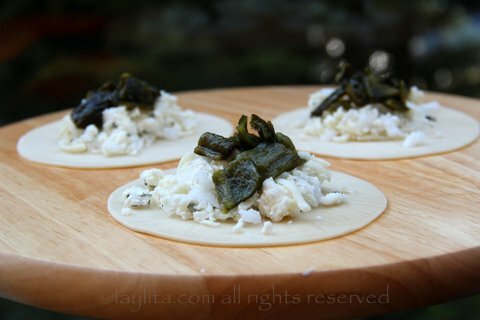 Rajas can be used in quesadillas, tacos, sauces, salads, soups, and obviously empanadas. 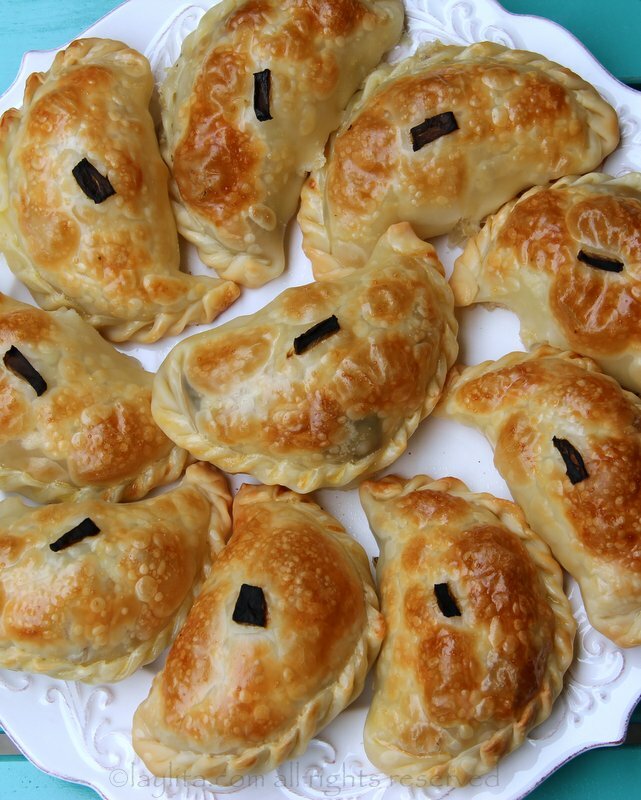 For these cheesy poblano empanadas, I used a mix of queso fresco, oaxaca cheese, and goat cheese. 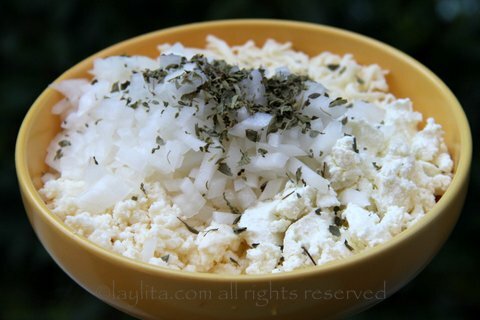 You can use the exact same mix or adjust it based on what you have available and the types of cheeses that you prefer. I recommend using at least one crumbly cheese, like queso fresco, goat cheese, feta, or cotija; and at least one type of cheese that melts nicely, like oaxaca, mozzarella, monterrey jack or quesillo. 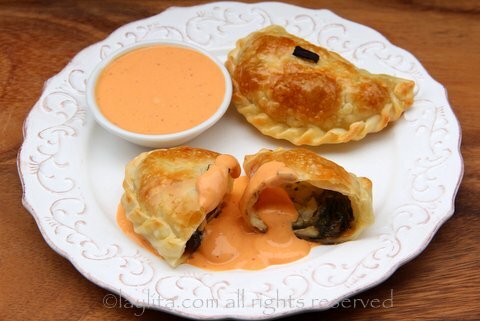 I served these poblano and cheese empanadas with a creamy yogurt chipotle sauce. 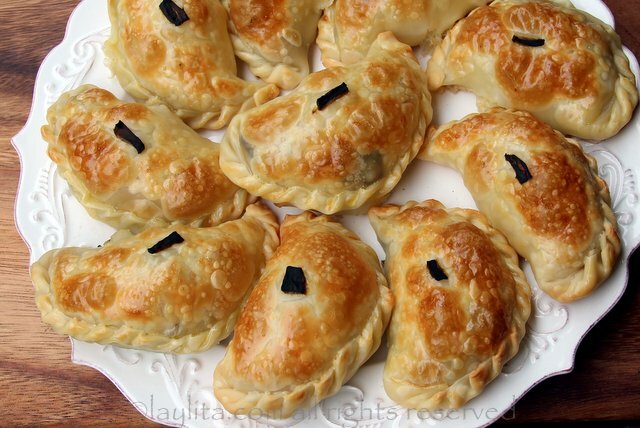 Do you think this empanada would go with a tequila cocktail that is fruity and tart? Can you freeze these before baking ? These look awesome, thanks for sharing. 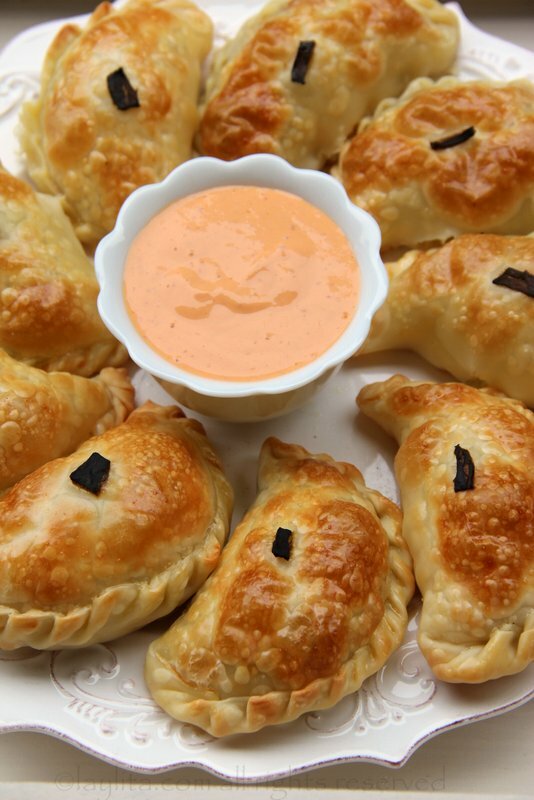 ground beef would be out of this world in this empanada. 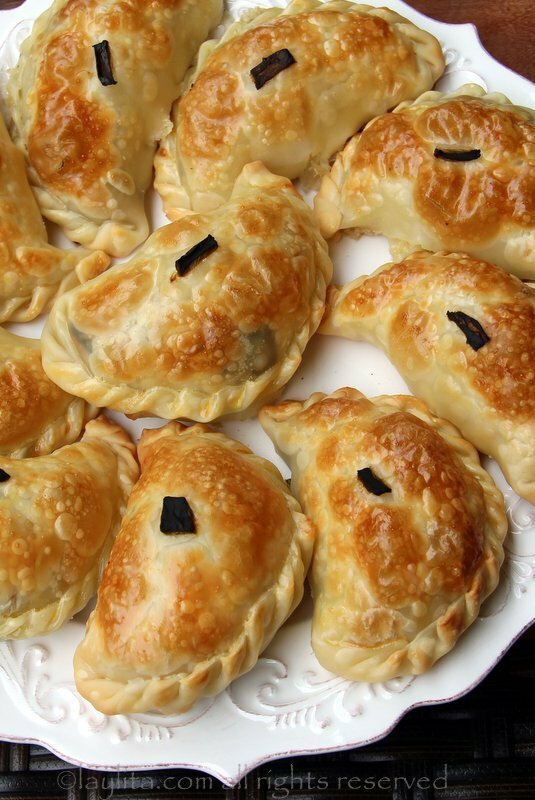 CAN’T WAIT TO FIX THE POBLANO AND CHEESE EMPANADITAS. THEY SOUND DELIGHTFUL. THANKS LAYLITA.